The Cuisinart FP-12BCN is an elite collection™ 12-cup food processor which is a machine of ground breaking performance and durability. It is ideal for fine chopping, kneading, shredding, mixing and slicing. The food processor features 6-position slicing disc and reversible shredding disc, small adjustable slicing and medium reversible shredding stainless steel discs and dough blades. The food processor comes with a patent sealtight™ advantage system for optimum mess-free working and a locking system with a push-button release. Its wide mouth feed tube assembly, pushers, and LED indicators assists to the smooth working. The Cuisinart-Food Processor has many exciting features for users of all types. You can extend the lifetime of your Cuisinart-Food Processor with the purchase of a FactoryOutletStore Factory Protection Plan. 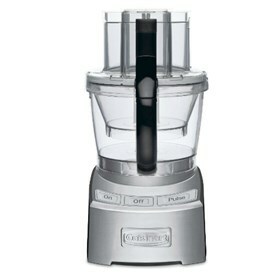 The Cuisinart-Food Processor is sold as a Brand New Unopened Item.